A few months ago I was lucky enough to procure a sourdough starter from a friend. 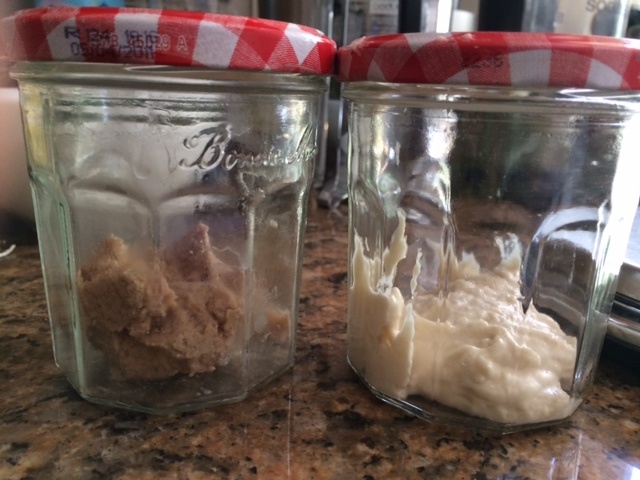 I’ve attempted to make a sourdough starter from scratch before using wild yeast from the air and while my starter definitely got bubbly, the smell was funky and unappealing. I probably just needed to keep at it, but the bread I made with it didn’t rise and I quickly lost motivation to keep feeding it. When my friend told me she had sourdough starter to share, I was thrilled. This time, though, I wanted to make sure to maintain it properly. She pointed me to the website Viva La Focaccia to read up on sourdough starters. I also like The Fresh Loaf for more sourdough starter information, recipes and tips. The sourdough starter I received was 100% All-Purpose (AP) flour. 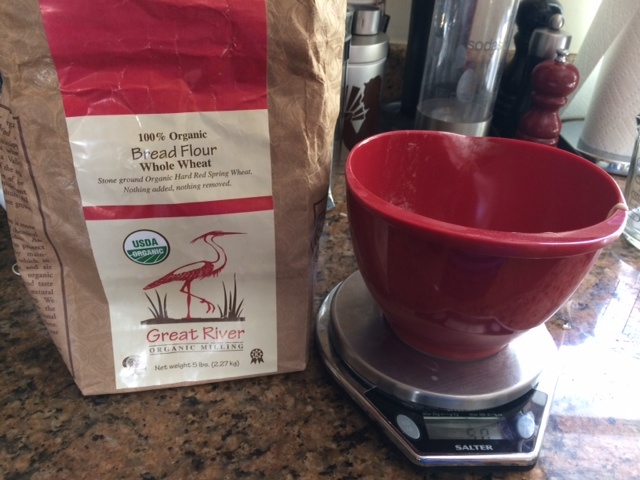 From my reading, I learned that if you want to make whole wheat (WW) bread, you should use a whole wheat starter. So after refreshing my AP starter, I used the extra and started converting some of it to a WW starter (and kept some of it . Basically, I mixed AP and WW flour to refresh the starter and increased the amount of WW flour each time I refreshed it over a few days until I reached 100% WW flour. That method seems to have worked, because I’ve been successfully using the WW starter for over a month now to make WW Sourdough English Muffins. Since I need my starter to be low maintenance right now and don’t have time to make bread daily, I keep it in the fridge and refresh every week or two. When I need to refresh it or before I want to make bread, I take it out along with my kitchen scale. Refreshing a starter only requires some old starter, flour and water. The amounts you want to use are 50 g starter, 50 g flour and 40 g water. If you want to refresh more (or less) starter, just use equal weight flour and 80% of that weight in water. Refreshing is very easy. Just mix all the ingredients together (I like to mix with my hand), wash the container you use to store the starter and put it back in the fridge. To simplify my life the next time I refresh, I like to weigh out 50g of starter and only store that in the fridge. I usually use the extra to make English muffins. We go through a lot of english muffins in our house, so they’re the only thing I have been making on a weekly basis. This entry was posted in Uncategorized on May 16, 2014 by seedsowingmama.